For those looking for an ultra high quality plush rocking horse that is built to last for generations and passed down as an heirloom, this is definitely the one! 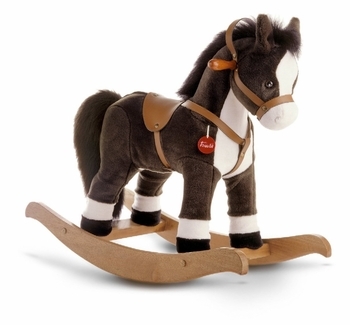 Available with dark brown or beige with white accents, this is simply the finest quality plush rocking horse available anywhere. It is an exceptional gift for any new baby and makes a terrific first birthday present, too. Designed and tested in Italy to the highest safety standards, each horse is skillfully made and sewn by hand using only premium grade materials and even includes a limited lifetime warranty. Unlike other rocking horses, these are not stuffed. Each incorporates a single molded polyurethane foam body surrounding a solid steel frame that supports up to 110 pounds for years of safe riding. Please click on More Images above to see a photo of the molded foam body and the beige horse version. The exterior fur is extremely soft as well as non-toxic and fireproof. This material is double woven and double stitched for durability and is easily washable with soap and water. The horse�s eyes are ultrasonically sealed from inside the body to assure that they can never come loose. The entire structure is then affixed to a varnished solid hardwood base to complete this heirloom quality masterpiece! Each toy is stringently tested to ensure compliance with both ASTM (United States) and EN-71 (European) safety standards. Adult supervision is always recommended. This just arrived and I wanted to let you know how pleased I am with this rocking horse. It is not even close to others I have seen and the quality was apparent as soon as I opened the box. It is heavy and sturdy and I'm sure it will last a long time! Just awesome!! !